Today, there’s a healthier alternative to energy drinks available. X2 has no artificial ingredients, less sugar, fewer calories, and less caffeine, yet still provides the energy you need on the go. If you’d love to try X2 and get all of the benefits it offers, have it delivered to your home or office today with Tyler Mountain Water & Coffee in Poca, West Virginia. What is X2? X2 is touted as a healthy energy drink that offers all the energy you need and a great taste. The drink is all natural, with no artificial ingredients. It also features less sugar than other energy drinks so you can avoid the jitters or crashing later in the day. The drink uses green tea plus fast and slow-burning sugars for a gradual increase in energy that leads to a sustained lift that doesn’t have a hard crash at the end. The drinks are non-carbonated and ideal to drink any time of the day. Need a lift in the afternoon? Because of the all-natural ingredients and the way the caffeine works, you can drink X2 in the afternoon and still get to sleep easily at night. What are the Ingredients for X2? 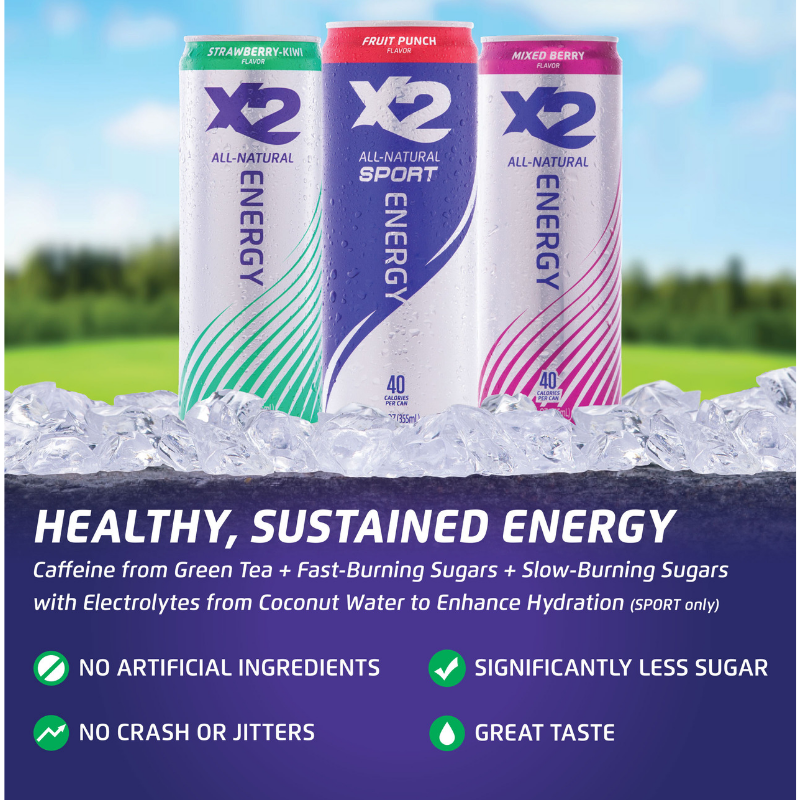 The all-natural ingredients in X2 include green tea to supply the caffeine and antioxidants, pure honey as a slow-burning energy source, and cane sugar as a fast-burning energy source. Other ingredients include ribose which helps with sustained energy and electrolytes which help you avoid dehydration and muscle fatigue. In the sport X2, coconut water is also included. This naturally provides potassium, part of the electrolytes you need to stay hydrated. What Flavors are Available for X2? A variety of different flavors are available for X2. For original X2, choose from strawberry-kiwi, raspberry, mixed berry, or lemon. The sport X2 is available in fruit punch, grape, and orange. The pro-sport X2 is now available in an orange flavor. Try out all of the different flavors to find the one you prefer. How to Purchase X2 Today Tyler Mountain Water & Coffee now offers X2 as one of the products they deliver. We deliver to both commercial and residential customers. Known for our water delivery, we now offer more types of drinks like the X2 as well as other products you may need. To start having X2 or other products delivered to your home or office, simply sign up on our website, choose what you want to have delivered, and set your delivery day. You can easily manage your account on our website and we’ll bring more X2 to your home each time you have a delivery scheduled with us. If you’re looking for an energy drink but you want to choose one that’s as healthy as possible, check out X2 today. All-natural ingredients and sustained energy in a variety of different flavors make this an excellent choice for your home or office. Schedule your next delivery with Tyler Mountain Water & Coffee today to have it delivered to your home or office.